This year marks the 20th anniversary of VTI Day in Bracknell and, once again, Boehringer Ingelheim employees will be helping out in the local community. In May, Boehringer employees picked up paintbrushes, gardening tools and rubbish bags to support a whole host of projects including helping Action for Children, which is again our charity of the year. VTI stands for Value Through Innovation and, in turn, is what Boehringer Ingelheim stands for; we are continually looking to develop new solutions for our customers and patients. Our aim is to contribute to a sustainable environment for the future and this includes corporate responsibility, as befits an altruistic family-owned company. This does not begin and end with VTI day, however. As a company, we are committed to family health and the first aid initiatives that we have established in recent years with the local newspaper, the Bracknell News, are, in my opinion, fantastic examples of ‘best practice’ in providing value through innovation. There is nothing more important than life itself and these schemes have taught potentially lifesaving skills to children and adults alike. Every year, up to 150,000 people die in situations where first aid could have given them a chance to live. However, unfortunately, first aid training is not part of the National Curriculum, or – unlike many European countries – a requirement of the driving test. Therefore, there is a large gap in knowledge of such a vital skill, one that, locally, we are striving to help fill. 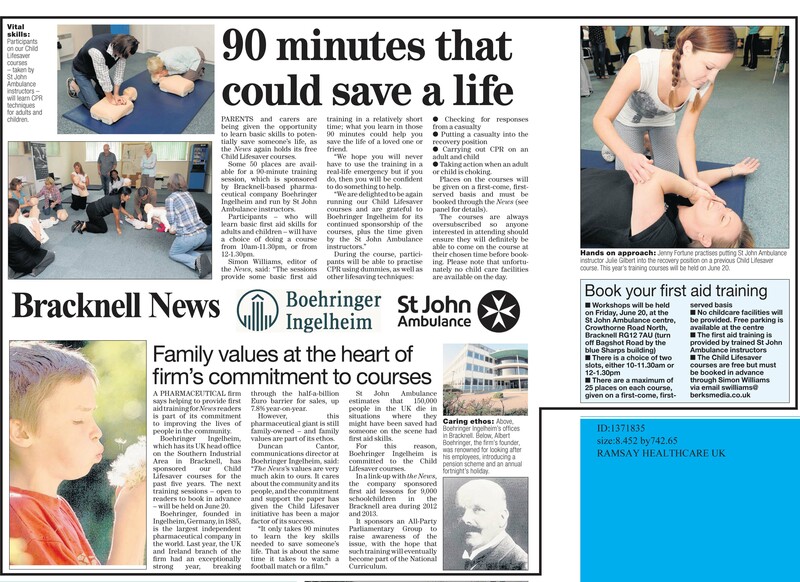 Boehringer’s involvement in free first aid training started in 2009 when, in liaison with the Bracknell News and St John’s Ambulance, we launched the free Child Lifesaver courses for adults to learn the basic skills required to save a baby or toddler’s life. Over the past six years, more than 400 parents, grandparents and carers have been given the training and confidence to act in potentially life or death situations. We have also held training sessions with St John Ambulance for Boehringer employees. It is important that first aid is taught as early as possible and therefore the logical progression of our successful Child Lifesaver programme was Boehringer’s sponsorship of a St John Ambulance schools liaison officer, starting in 2012. Over two years, nearly 9,000 youngsters in schools in the Bracknell area were trained in first aid, ranging from teddy bear sessions for younger children to more comprehensive training for secondary pupils. I am particularly proud of our continuing involvement with Garth Hill College in Bracknell, where, each year, Boehringer sponsors a whole year group – some 300 pupils – to each undergo five hours of training to gain the Young First Aider qualification. This has a huge, beneficial impact on the local community. We used the experience of our success at a local level to take our campaign for widespread first aid training to the national stage. In 2012, Boehringer – in partnership with St John Ambulance and MPs – launched an All Party Parliamentary Group (APPG) for first aid to raise the profile training of this key skill for everyone. I am pleased to say that such training in schools is now a major focus of all key first aid organisations in the UK. I am proud that our company has spearheaded these various initiatives and that I have been able to help drive these forward. I am also proud of all your various charitable initiatives, including VTI Day – as indeed you should be proud of your own efforts. Whether it is through our products or our contributions in the community, Boehringer Ingelheim and its employees truly offer ‘value through innovation’ and embrace our company culture, Lead and Learn.